The funding of research by the Centre for Molecular Medicine & Biobanking of the University of Malta offers new hope for patients with two debilitating neurodegenerative conditions, Alzheimer’s dementia (AD) and Parkinson’s disease (PD). In the Maltese islands, around 8,000 individuals suffer from either condition. To date, the only treatment available are medicines that alleviate the symptoms, but do not prevent disease progression. This research aims to increase our understanding of how and why brain cells die and to use this knowledge to design new effective drugs, thus improving the care and management of individuals suffering from them. Simblija Care Home, Naxxar, offered generous financial support towards UM’s research in these areas, through the University’s Research, Innovation and Development Trust (RIDT). 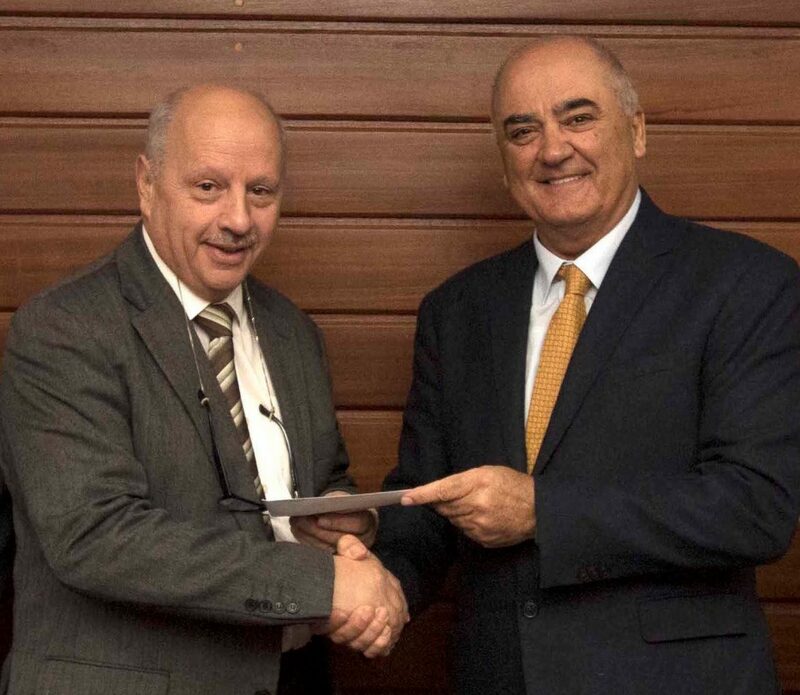 Mr. Angelo Xuereb presented a cheque to University of Malta Rector, Prof. Alfred Vella, in the presence of project co-ordinator Prof. Neville Vassallo, Pro-Rector Prof. Saviour Zammit, the Dean of the Faculty of Science, Prof. Charles Sammut, and Mr. Wilfred Kenely, CEO – RIDT. Prof. Neville Vassallo M.D., Ph.D. (Dept. of Physiology & Biochemistry) and his team are embarking on this 3-year project (2018-2020) in collaboration with renowned German research institutions like the Max Planck Institute for Biophysical Chemistry and the German Centre for Neurodegenerative Diseases in Munich. Their goal is to further the development of innovative medicines, such as a new drug called “anle138b”, that might directly delay the onset, or slow the progression of the diseases. This would represent a significant breakthrough. People with AD or PD would live a longer life with a better preservation of brain function. The project is also being funded by the University of Malta. University of Malta Rector, Professor Alfred Vella, said that he was glad to see the business community showing interest in and supporting the University’s research endeavours. He said it was the University’s mission to create new knowledge, working together with researchers from around the world for the common good of mankind. The RIDT was set up in 2011 as a collaboration between the Government and the University of Malta, with the objective of bolstering the research activity of the University, through the engagement of the various sectors of the Maltese community.